The DMR II Pro 3.5-21x50 is one of Bushnell’s latest tactical riflescope offerings. The DMR II Pro still sports all of the same features as the DMR II, with significant improvements made to optical clarity through the use of Bushnell’s ED Prime Glass. The ED Prime Glass used in the DMR II Pro provides outstanding vivid color and clarity that allows you to make out the finest details of your target (even in low light conditions). 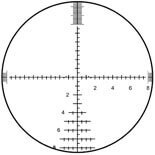 The DMR II Pro allows for a wide range of magnification and features a G3 reticle. Argon Purged: Never worry about internal fogging again. EXO™ Barrier: Repels and protects against water, fog, debris, and smudging. Bushnell Throwhammer™ Lever: Change magnification levels effortlessly with just one finger. ED Prime Glass: Ultra-high quality optical glass provides excellent edge-to-edge detail and color. Side Parallax Adjustment: Adjust for parallax quickly and easily without taking your eye off the target. Fully Multicoated Lenses: Layers of anti-reflective coatings provide powerful light transmission, brightness and contrast.